On 26 April, 2016, the Centre for Scottish and Celtic Studies welcomed Fraser Hunter and Martin Goldberg from the National Museums of Scotland to discuss ‘Looking behind Celts: views from an exhibition.’ Below is this listener’s brief summary of the lecture. Fraser Hunter began by explaining that the aim of this lecture was to discuss the creation of the Celts exhibition: what the aim of the exhibition was, how it was done, the processes of exhibition behind it and the similarities and differences with the British Museum’s exhibit, which ran from 24 September 2015 to 31 January 2016. The Celts exhibit is a joint project between National Museum of Scotland and the British Museum. The two museums produced different versions of the exhibit for their intended audiences and used a similar collection of artefacts to do so. This exhibit aimed to address the many images associated with the words “Celts” or “Celtic.” In the public view, these words may refer to the “Asterix model,” a sports team, or a type of music. The term is also used in different ways in specialities in academia: those studying Classical historians, Language, Early Celtic Art, Late Celtic Art, or Archaeology all use the term to discuss entirely different things. Because there are aspects of decoration and language connecting these many groups, the term “Celts” should not be dropped. The exhibit therefore focuses on the decoration of the “shiny stuff,” and seeks to situate this material culture in the wider European context, while highlighting the regionalized variances between these groups. The lecture was divided into four chronological sections: the Iron Age and a connected Europe, the Roman world’s impact, a new Christian world, and the rediscovery and revival of this material. Fraser began by discussing the Iron Age portion of the exhibit. The artefacts from this period, beginning in the 5th century BC, incorporate influences from a variety of sources, including local influences, the Classical world, and a wider Eurasian world. This sudden shift in the decoration of these objects suggests that there was a fundamental change in how these people conceptualized the gods. Although we no longer have the stories and context to fully understand these objects, undoubtedly the abstract images represented important events or myths to the people who crafted them. Very little material from this early period is present in the British Isles until the 3rd century BC. When these artefacts reach the British Isles, they show evidence for local production as they modified the Continental designs to include local ideas. The Gundestrup cauldron demonstrates the breadth of connections made during this period: it depicts torcs, carnyxes, elephants and gods in yoga positions. While the torcs and carnyxes are found elsewhere in the Celtic world, it is thought that the cauldron was produced in southeastern Europe, took inspiration from both the West and East and was eventually deposited in Denmark. Fraser continued by discussing the impact of the Mediterranean on the Iron Age world. During this period, there is a development of coinage based on Greek and Roman coins but which is designed with more abstract imagery. There is also a shift from individual masterpieces to mass-produced items decorated with these transformed classical forms, although there is a decrease in spiralled designs on the Continent. In Britain and Ireland, these swirly, individual masterpieces continue, although the densest concentrations of these finds were confined to areas of Roman conquest. While this could be described as an “art of resistance,” this appears to only be part of the story. There are artefacts with Roman forms and made of imported goods from the Mediterranean are decorated with triskeles and other Celtic motfis in these areas of conquest. Instead of labelling these objects as evidence of resistance, they should be seen as the creation and adaptation of a new identity through the use of hybrid designs. The second portion of the talk was led by Martin Goldberg, who discussed “A New Christian World” and the Celtic revival portions of the exhibition. Martin emphasized that, during the first millennium AD, there was a fundamental shift in the art of this period which can be traced to the introduction of a whole new belief system, Christianity. This shift in art style and religion indicates a significant change in the way people saw their lives and their deaths. 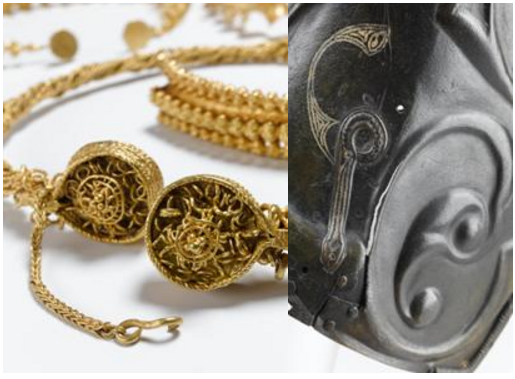 While trumpet scrolls and triskele spirals carried on into the early medieval artist’s repertoire, connections with their neighbours, the Anglo-Saxons, and the wider Christian world introduced animal interlace, key pattern, and interlace. While this Insular fusion style was still used in metalwork, these objects shifted in scale to being small and personal. These Insular designs were also applied to more materials, especially manuscripts and stonework. At the end of this period, many of these motifs fell into disuse in favour of interlace and more naturalistic decoration. Martin stated that there is a significant gap in the material culture utilising these motifs after this period until around 1500 AD. At this point, the printing press made Classical sources more widely available, and this played a big part in reintroducing the term “Celts,” which hasn’t been used with any consistency for at least a thousand years. In the exhibit, they emphasized how this Celtic revival was affected by language, European Romanticism, and the growth of antiquarianism from the 16th through the 18th centuries contributed to the foundation of nations, and how they appropriated their own past. In the 1850s, Daniel Wilson wrote “The Archaeology and Prehistoric Annals of Scotland” in which he endeavored to apply the Three-age system to the national narrative of Scotland’s past. He was the first to use the term “Celtic art” in relation to objects from the past. J. O. Westwood made Celtic art more widely available in 1856 in his design manual on Celtic Art in “Grammar of Ornament.” Fascination with and the imitation of these objects continued through the 20th century as objects continued to be discovered. In conclusion, while the British Museum and National Museum of Scotland used largely the same objects, the exhibition space available and way in which the objects are framed led to the production of two rather different exhibitions. The British Museum utilised an exhibition space double the size of that used in Edinburgh and emphasized the nationalism of the Celtic nations of Scotland, Ireland and Wales. The National Museum of Scotland emphasized the modern creation of the idea of the Celts juxtaposed with the four chronological blocks and utilized audiovisual elements that weren’t available in the British Museum. Overall, twenty-six different lenders contributed to the exhibition. The Celts exhibition is being held at the National Museum of Scotland until 25 September 2016. More information about the exhibit can be found here. Personally, I have been twice and strongly recommend it! Our seminar series continues on 3 May 2016 with Alice Taylor (King’s College London) to discuss ‘The Shape of the State in Medieval Scotland 1124-1290.’ This will be held in Room 202, 3 University Gardens at 5.30pm. There will be forms available on the night for anyone interested in ordering her book at a discounted price.